Blog » Skincare » Does Resveratrol Live Up To Hype? Clear Skin Without Side-Effects? Resveratrol seems like the magic pill we’ve all been secretly hoping for. Many researchers believe it’s the secret behind the “French paradox”, and study after study shows it can protect against countless health conditions. And when there’s hype the supplement and skincare companies are never far behind. Indeed you can find countless products touting the benefits of resveratrol. Recently, I found out that some companies are pushing resveratrol acne creams. So I wanted to find out if there’s anything to them. It turns out there could be. In the past two years a couple of interesting human studies have come out, some evaluating topical resveratrol and some looking at supplemental form. These studies indeed show resveratrol has potential as an acne treatment. Resveratrol is a fairly new entrant to the skincare market, aside from anti-aging, so there are only a handful studies evaluating it. And those are pilot-studies to boot. That said, the evidence looks quite promising. The best study of resveratrol comes from a group of Italian researchers. They recruited 20 participants and gave them 2 gels: one containing 0.001% trans-resveratrol and a placebo gel that lacked resveratrol but was otherwise identical. The participants were blinded and didn’t know which gel was which. This was a split-face study; the participants applied one gel to left side and the other gel to right side. Acne severity as measured by Global Acne Grading System (GAGS) that takes into account the number and type of pimples. Average area of the face prone to getting acne. This was done by measuring the area of the skin occupied by microcomedoes, a sort of blocked pores that can turn into full-blown pimples. Both measures were done at the baseline and after 60 days treatment. The results were striking, to say the least. 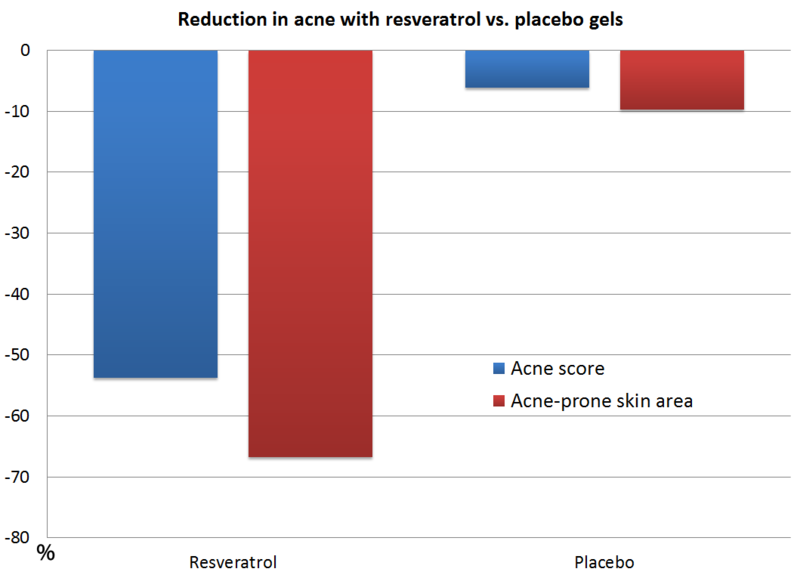 This graph shows %-reduction in both acne score and area of face prone to acne for resveratrol and placebo gels. The graph speaks for itself. Roughly 55% reduction in acne score and nearly 70% reduction in skin prone to acne for resveratrol gel, with the corresponding figures being less than 10% for the placebo gel. And keep in mind this was a split-face study, so possible dietary and lifestyle changes would have affected both sides of the face equally. Before you get too excited, let’s keep in mind that this was a just pilot-study. The results look very promising, but let’s not jump to conclusions based on a single study. Without comparing resveratrol to existing products with known efficacy (like BP or vitamin B3), we don’t really know how well it works. Strongly antioxidant and can thus protect the skin from inflammatory damage. It seems especially effective at inhibiting skin damage from UV rays. One human study even showed resveratrol can prevent skin damage after sunburn. In the study researchers exposed upper back of the volunteers to UV radiation at levels that would cause mild sunburn, they then applied resveratrol, antioxidants or nothing to the exposed sites. Resveratrol treated sites showed almost no sunburn or skin damage whereas the other sites showed sunburn damage as expected. May inhibit the mTor pathway and thus affect almost all factors behind acne, see the natural mTor inhibitors post for more details. Inhibit the growth of bacteria on the skin, though its potential for bacterial inhibition is much lower than that of benzoyl peroxide or other established treatments. I also came across with an interesting study evaluating anti-aging potential of reservatrol-procyandin supplement. Procyandin is a flavonoid, like EGCG in green tea. This study didn’t look at acne, but they looked at several proxy-measures for skin health, such as skin antioxidant capacity and moisture loss. Both of which are also linked to acne. The study also looked very rigorous (double-blinded and placebo controlled), so I’m fairly confident that the results will hold. I won’t go over the study in detail, you can read it yourself here. I’ll just highlight the results relevant to acne. But first, the study had 50 participants (25 in the treatment and 25 in the placebo group); 35-60 years old; treated for 60 days. Here are the relevant graphs from the study. This graph shows one measure of antioxidant capacity of the skin before and after the treatment. Here’s another graph of antioxidant potential. 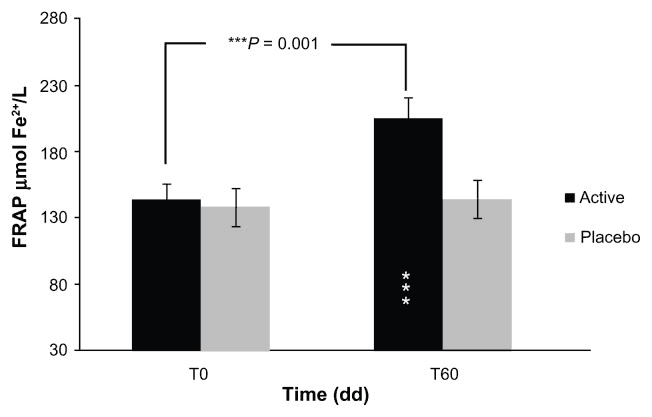 The first graph shows oxidative (inflammatory) stress on the skin and the second shows another measure of antioxidant capacity. Clearly the supplement did a lot of good for the skin. Improvement in skin hydration usually means better skin barrier function, which in turn protects the skin from bacteria, dust and other ‘bad stuff’. I’ve written many times about how inflammatory damage to sebum is the trigger that starts the whole pimple formation process, and protecting the skin with antioxidants could be a way to stop that process before it even gets started. That’s why increase in skin’s antioxidant capacity is very likely going to reduce acne. See my earlier post about a study that showed a nice reduction in acne with antioxidant supplements, so this is not just a theoretical concern. I want to also mention bakuchiol, a substance derived from the seeds of babchi plant and apparently used in traditional Chinese and Indian medicines. Apparently it’s a resveratrol analogue, so structurally very similar. Data source: Resveratrol-procyanidin blend: nutraceutical and antiaging efficacy evaluated in a placebocontrolled, double-blind study. My apologies that this chart is upside down compared to the first chart, Excel error. Anyway, as you can see, the combination of 1% bakuchiol with 2% salicylic acid produced the best results. These results seem a little optimistic to me. Salicylic acid is not a very effective acne treatment; it works for mild acne but by itself is fairly useless in cases that fall into the moderate to severe range. So bakuchiol giving slightly better results that SA alone isn’t very impressive. It inhibits P. Acnes bacterial growth better than salicylic acid. It shows fairly strong anti-inflammatory activity. It can inhibit 5-alpha reductase activity (5-AR) and thus reduce conversion of testosterone to DHT in the skin, one of the reasons acne-prone skin produces more sebum than normal skin. 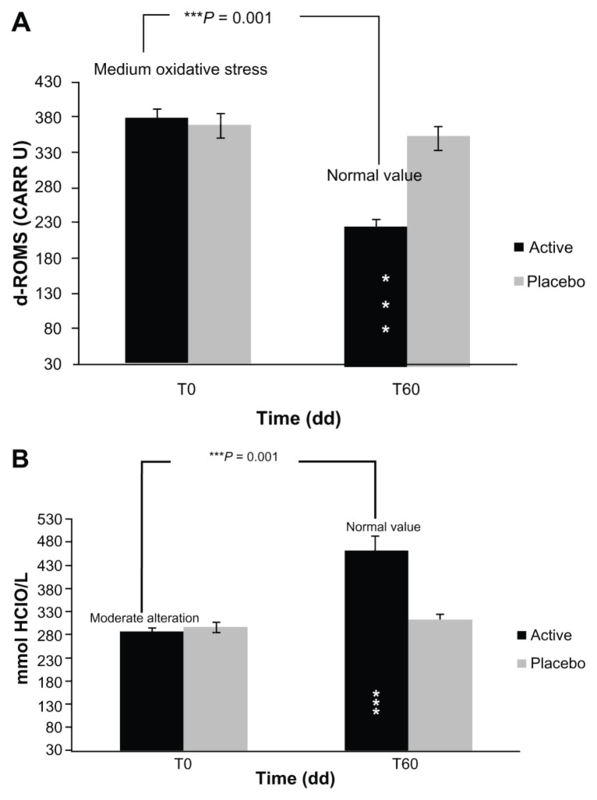 Bakuchiol ‘s 5-AR inhibition capacity was comparable to retinoic acid (topical retinoids). The above are based on in vitro studies. I also found reports of a small, pilot study reported at the annual meeting American Academy of Dermatology. 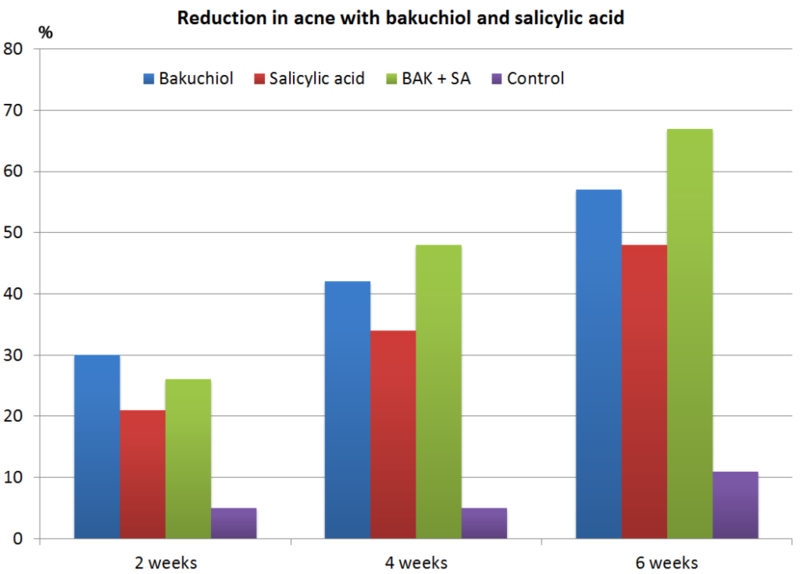 In that study 0.6% bakuchiol cream showed reasonable acne treatment potential. I won’t do into the results in detail because the study had no control group or blinding, which renders the results almost useless. So what to make of these? Are resveratrol and bakuchiol new miracle treatments for acne? It’s too early to say about that, and probably not. But these studies show, again, the potential of antioxidants in acne. Study after study after study brings home the same results; antioxidants reduce acne. So while resveratrol and bakuchiol may not be miracle cures for acne, you can add them to the growing list of proven acne fighting antioxidants. Others on the list include vitamin B3, vitamin C precursor sodium ascorbyl phosphate and green tea catechin EGCG. A formulation that includes one or more of those ingredients should be very good for your skin. Though I should say that vitamin B3 and resveratrol may not mix; apparently they work via different pathways and B3 inhibits the resveratrol pathway. Resveratrol-procyanidin blend: nutraceutical and antiaging efficacy evaluated in a placebocontrolled, double-blind study. Resveratrol inhibition of Propionibacterium acnes. 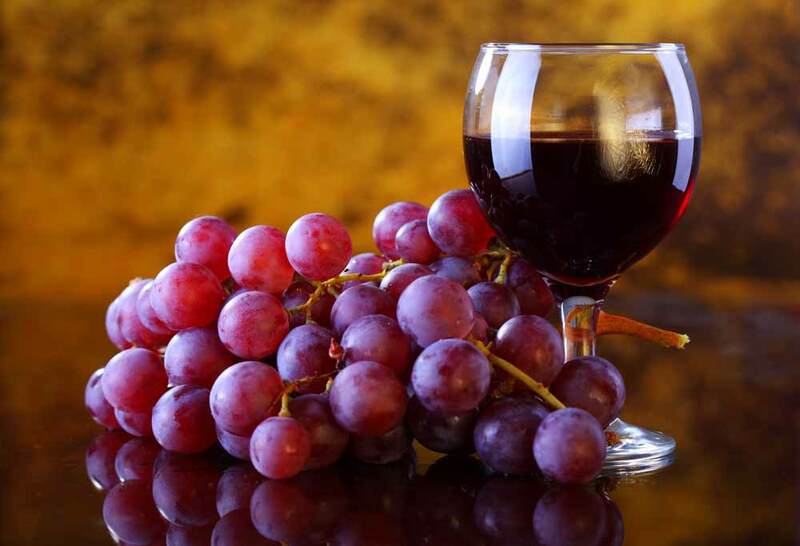 The Grape Antioxidant Resveratrol for Skin Disorders: Promise, Prospects, and Challenges. 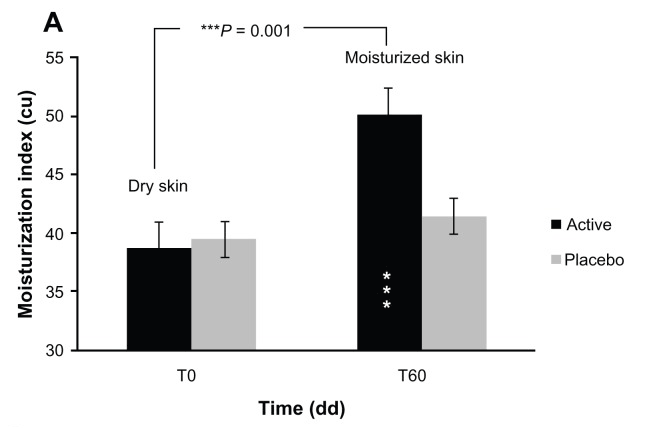 Resveratrate protects human skin from damage due to repetitive ultraviolet irradiation. 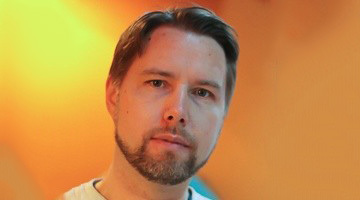 So what is the conclusion of what we should do and how to implement this? Any creams you recommend that have this in it? Should we take a resveratrol supplement? The data shows resveratrol can be helpful in acne. I’m not sure I would take resveratrol as supplement, but I would keep it as one option for topical skincare. This is a very interesting article. I’ve been researching the connection between antioxidants and acne lately, and it all looks very promising. . . Except that it’s not always easy to find a product with antioxidants that’s right for my skin – and I assume other people have similar problems. Most of what I tried makes me break out when I’m otherwise clear. Obviously, there is no reason to torture my skin with something that it doesn’t “like” when there are so many products on the market. One moisturizer that I really like has totarol – though not much of it – but it definitely doesn’t make me break out, and feels very soothing after I apply it. Also seems to calm down a lot of the redness after my unsuccessful trials with other products. Have you come across any studies about the effects of topical totarol on acne? I wonder if I’m having good results with it because of the antioxidant’s effect on acne, or simply because it’s a good moisturizer that doesn’t lead to breakouts. Yep, the use of topical antioxidants on acne is one of the more promising natural approaches. I could only find 1 paper on total and acne. It showed totarol has quite strong anti-bacterial properties against acne-causing bacteria. I couldn’t find any studies where totarol containing cream was used to treat acne. Google did bring up one case report where a doctor reports totarol containing moisturizer helped his 14-year old patient. But one can’t make any conclusions based on case reports. Have you heard of Shaklee’s Vivix? It is a resveratrol liquid supplement that says it has 1290mg resveratrol from a few all natural sources. Is this legit? Helpful for acne/inflammation? I can’t comment on the merits of individual supplements brands. I really have no way of knowing what’s good and what’s not. Resveratrol is an antioxidant. If you are already planning to take sillymarin then I wouldn’t bother with resveratrol. It’s not a good idea to take too many antioxidants. I just read that B3 and Resveratrol is not the best mix. Do you really think they cancel each other out? Nobody can say for sure. Most of that is relevant for anti-aging purposes anyway. There’s plenty of evidence to show vitamin B3 is helpful in acne. I also purchased the Madre Labs Camellia Care EGCG cream) and used it once. My concern with this is that while it contains tea tree oil (which, as you said, makes it viable as a treatment cream), it also contains glycerin. Is this potentially pore-clogging, or do the cream’s other antioxidant properties override this? I want to be as open-minded as possible, but I’ve always had “no glycerin” drilled into me by dermatologists. Please advise!!!!! This is the first time I’ve heard anyone saying glycerin clogs the pores. It’s rated 0 on the comedogenicity scale. While I don’t think looking at comedogenicity ratings for ingredients is particularly useful, it can help you to identify those that don’t clog the pores, i.e. ones rated 0 or 1. Glycerin is a humectant that binds moisture into the skin. As such it can be helpful. The only negative I’ve heard that in dry climate glycerin can actually draw moisture up from the deeper layers of the skin, instead of pulling it from the air. This study used DMSO as a solvent for resveratrol. DMSO is known to help with acne by itself so it makes sense that a combination would be effective. I plan to try this for my son.